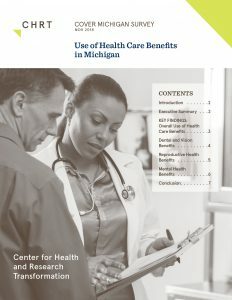 Data from the Center for Health and Research Transformation’s (CHRT) 2018 Cover Michigan Survey show health benefits that Michiganders with health insurance coverage have used in the past year 1. Detail on the Cover Michigan Survey and analysis methodology can be found on CHRT’s website. 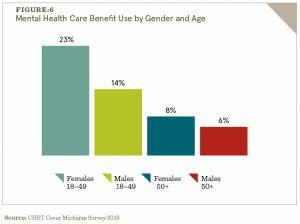 In addition to findings on overall use of health care benefits, this brief focuses on three key areas: dental and vision, reproductive health, and mental health care. A full analysis can be found here. 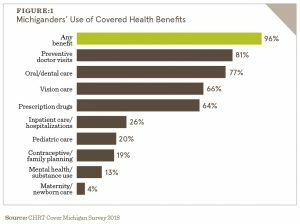 Nearly all Michiganders used some kind of health benefit over the last year. To understand differences in the use of health care benefits, several variables were examined, including gender, age, race, insurance type, income, and employment status. Preventive care: The highest utilized benefit was routine, preventive primary care This was consistent across all groups. 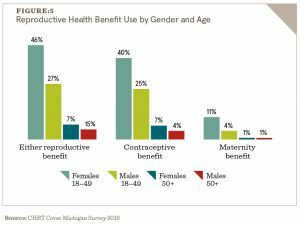 Reproductive health care: Women, especially younger women, use these benefits at a significantly higher rate than men and older Reproductive health care represents 11 percent of younger women’s health care utilization. Aside from dental and inpatient care, women consistently utilized more health care benefits than men. Medicaid beneficiaries had the highest utilization of pediatric care, contraceptive/family planning, mental health/substance use, and maternity/newborn care benefits; and Medicare beneficiaries made the most use of the prescription drug benefit. These differences are likely due to the unique populations that make up membership in these plans. 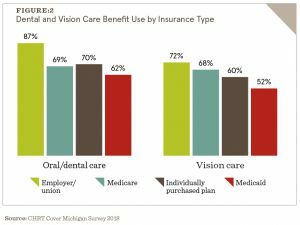 Unlike other benefits highlighted in this brief, dental and vision coverage are usually purchased separately from core health insurance offerings. Our data indicate that these are very. 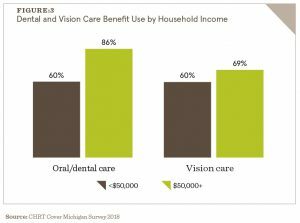 important, highly used benefits Overall, more than three-quarters of respondents reported using dental care and two-thirds reported using vision care. FIGURE 1 While these services are important to Michiganders, there are disparities in use—primarily by the type of insurance FIGURE 2 and household income FIGURE 3. While mental health and substance use services are one of the least utilized benefits in the general population, nearly a quarter of both younger women (aged 18–49) and the unemployed population used these benefits in the last year. FIGURE 6 Mental health services can often be among the most difficult services to access,2,3 and this may be especially relevant for the unemployed population, who may be more in need of these services than those who are able to work or are retired. FIGURE 7 Those with a greater need for mental health services may have a harder time maintaining work. 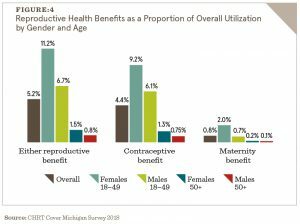 Mental health and reproductive health are used less, compared to other covered benefits, and there are also significant differences in who is using these services. Efforts to change access to these benefit offerings will disproportionately affect specific groups, in particular younger women and the unemployed. Future briefs will look at access to care for covered benefits and will explore how access affects use of those benefits. 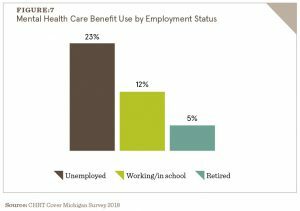 Survey participants were asked whether or not they or other family members covered by their plans used each health care benefit in the past 12 months.